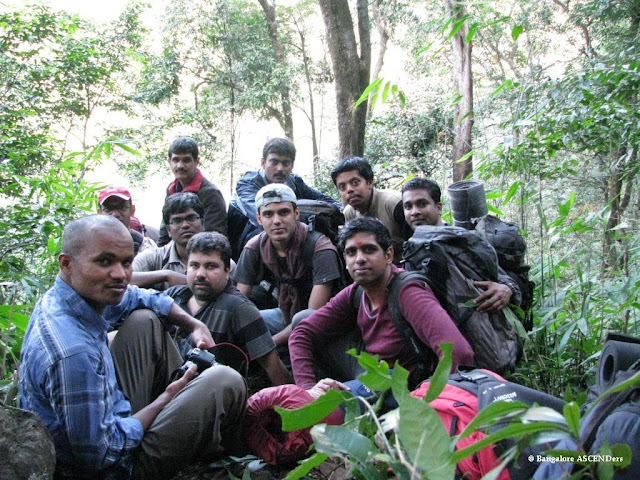 Aramane gudda trek on Jan 8th and 9th was an first big event to start the new year 2011 which was organized by Bangalore ASCENDers (BASC). Event organizer Ambareesh, sent out a mail just 15 days prior highlighting 3 past tragedies that happened in and around Aramane Gudda. a) 3 trekkers lost their way while exploring Aramane gudda and their skeletons were recovered after 9 months(reported missing from 28th May-06 and skeletons found on 20th Feb-07).b) 2 Navy helicopters have crashed in the vicinity of Aramane gudda in the recent past.c) In March 2009, a man was hacked to death by a rouge tusker in Kempuhole river, soon after 2 cattle were eaten by a tiger. 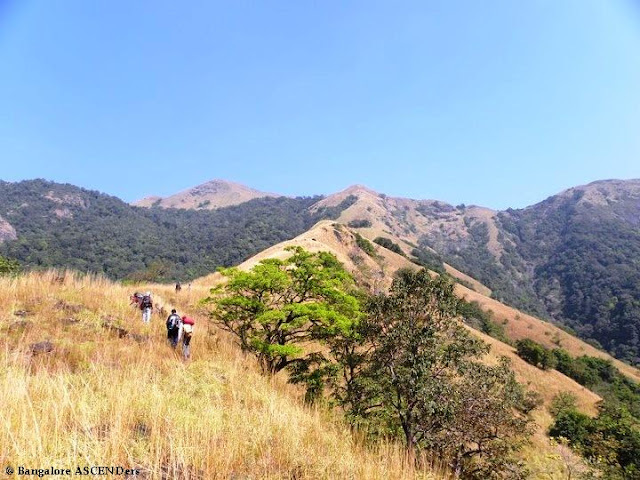 For these reasons Ambareesh Karanth limited registration for only experienced trekkers. This trek is tough not in terms of the distance covered. But, in terms of trekking in scorching Sun and steep terrain. And also we were no sure if water would be available at the top. 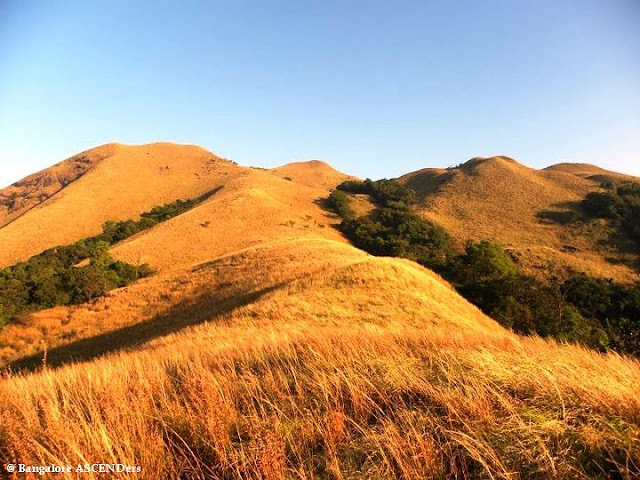 About the Place: Aramane Gudda is in Western Ghats between Kadumane and Kabbinale Reserve Forest. There are two approaches to it, one via Kadumane Estate and another from Shiradi Ghat on Bangalore-Mangalore NH48. Aramane Gudda is at an elevation of 1200m and just 4km climb from NH48. Note: * Need permission from Forest department as this is restricted area. Day1: 11 brave trekkers from BASC started on Friday night in a bus booked to Dharmastala. On early Saturday morning we got down at Gavadi Chaudeswari Temple, 6kms before Gundya at around 5AM. Many drivers pray to the Chowdeshwari deity and continue their travel. We took rest in the temple premises and waiting for sun to come. There is a small river named Kempu Hole flowing right of the temple, where we did all our morning activities. And also there are few small hotels and shops. We started our trek by 7AM after deviating from the main path to avoid forest check post towards shrub jungle. This part of the trek was tough, had to cut lots of branches, had to pierce through lots of thorns; and above that had to trek through tough terrain. Initial 2 hrs of trek was in the thick jungle. Since only few people trek in this route, could hardly see any trekking trial. By 9AM we took a break before entering grass land for 30mints to have group photos and breakfast. Then slowly we were coming out of thick forest; to slowly enter into grass-lands. The grass were some 7 Feet tall, and had to pass through them. There were lots of big stones on which we had to keep our foot and trek. We didn't see any snakes though. Slowly the tall grass gave away with small grasses, but lots of stones/rocks/boulders; what ever you may call it. By 10AM we are out jungle, we could hear the rail engine sound from the peak opposite to us (backside) and also could see railway track (Green route). From here climb was very tough, as sun was right above our head. It was damn hot and we were dehydrating. We were afraid to drink water; because we wanted to preserve as much as possible. We could hardly see any trees in the vicinity to take rest. If we sat to take rest; this scorching Sun was de-hydrating us even more. We saw a bunch of trees at the far end. We kept on running fast to get under that trees. I guess this was the first time I hated Sun. We took rest under the tree; had lunch there and started our trek. From now on the terrain was very steep. And it was afternoon 1PM with Sun right above us.We started slowly with aim to get to the top. There was lots of stones and mud was quite sleepery. We wante d rest for every 20 steps we trek. But, had to gallop and keep pushing ourselves. We saw a small Water-falls at the far end. So, were happy that there is some water source at the top. And our next target was to reach it. Everyone was very tired by now and with very less water in bottle. At this time Girish and Murali took a deviation downwards towards the stream, and soon Ambareesh also followed to guide them. Girish leg gave up and he decided to climb down insead of climbing ip ,in search of water with Murali. They both left Ambareesh, who climbed back to reach the water point to join rest 8 trekkers. We 8 were moving along the grassland and must have taken half a dozen rest to climb the mini-peak at 3:30PM. Bhargav was ahead of us and everyone followed him. We saw the main peak at the far end. But, decided to go to the stream which was towards right of us. We went on the route to water source and entered a mini-forest. Saw a small stream and were damn hap py. Ambareesh was already there before us, as he has taken a short cut after leaving Girish and Murali on a dried-up small stream. He along with Bhargav filled 4 bottles with water, went down again to look for Girish & Murali. But they returned at 6PM without finding them. Actually those two went down to the stream and they traversed along it on Day2 to reach back NH48. (They have a different story to tell and is very thrilling). We washed ourselves and collected water. Sun was about to set, so were searching for the right place to camp and collected wood for campfire. Few witnessed sunset along with their camera. Before it became dark Santhosh (Kumar) and others lit camp-fire. In front of the camp fire we formally introduced ourselves and discussed many useful top ics. And later had Dinner; and seeing millions of stars above us we slept early as we were very tired. We got up early to see first light of the morning. On the way back our plan was to cover the grass-land before the sun comes above us. We went to the mini-peak which we had conquered on Day1. Then from there started to trek the main Peak, ARAMANE GUDDA. We left our luggage at the mini-peak and carried a bottle of water to climb the main peak. It took nearly 1.5 Hrs to climb the main peak. We reached the peak at 9:00AM. Aramane Gudda peak is at a height of 1200 MTSL. From here we could see Ombattu Gudda, Jenkal Betta, Deepadkallu and many more peaks. After having few group and solo photo sessions at the top, we started to descend down by 10:00AM. Now, decending down was even more tough. Had to concentrate to keep each and every foot. Since the mud was sleepery; had to fall many a times. Luckily not much of serious injuries. Getting down did not take much time and effort as we were prepared for the worst! and also we had ample water in our bottles. And whenever we saw the Aramane Gudda peak back to us, no one believed climbed it! Vikas and Santhosh (Korgal) were very lucky as they got back Sun glass and Mobile which they had last in Day1. We crossed grassland and entered jungle by 1PM. We had lunch under the shade and chatted for an hour. The best of the trek is not trekking. But, when we are really tired; we sit down for food and chat. No useful talks. But, talks which rejoices us :-) Everyone will definitely remember it for a long time. After having lunch we descended further and it was our last stretch to NH48. But, at the last stages we were faced with lots of thorns. God, my hand had lots of bruises. When we were nearing the main road, could hear the sounds of trucks. We were happy that we were about to accomplish our trek. After reaching the main - road we went to the Kempu Hole river to have a cold-bath :-) We reached NH48 by 2:45PM. After bath we took the bus to Dharmastala by 4:30PM. Had darshan of Lord Manjunatha and had very much satisfying dinner at the temple. Girish & Murali were already here and they joined us. Finally by 11PM we boarded our late night bus back to Bangalore. * Please avoid this trek from January to September. In winter and summer water is not available for whole Day1. * Need permission from Forest department as this is restricted area. * Kadumane side approach will be easy trek compared to NH side. 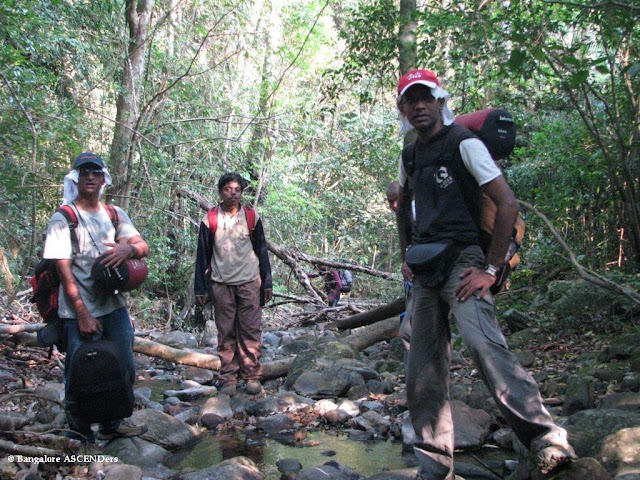 Do you have any guides contact info for the Aramane Gudda trek?